Residence Welfare Association (RWA) activities are the best way to create brand awareness and connect with the potential buyers at the grass root level. RWA is one of the best and efficient brand promotion method. We help you by organizing and managing such activation program by setting up food stalls, game shows, cultural or musical nights to gather the community at one place. Mall Promotion is one another very good option for promotion of your product and company. If you want to sell some product then Mall Activation Promotion is best way as your audience is already in spending mood so if you pitch your product in an appealing and right manner the chances of sales increases exponentially. We are amongst the top brand activation agency, coming up with creative ideas for your brand & take the appropriate permissions required for its execution. 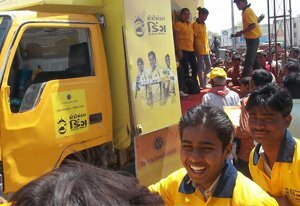 Road Shows are an effective way of sales and marketing. We help you in planning, organizing and managing the roadshows for your company customized according to the need of the campaign. You will get new and creative ideas from us. We take care of the required permissions and clearance from local authorities before doing any road show so you need not worry about it at all.